I feel like I have a hangover…I think it’s the after affects of the holidays. There is always such a big build up to Christmas and then BAM, it’s here and just as quickly, it’s over. Friday and Saturday were a lot of fun for us. We had lots of quality time with both our little family and with the extended family. 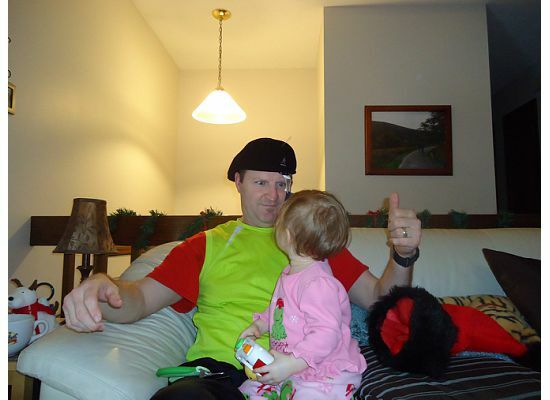 It was so much fun to see Christmas through Isabella’s eyes. 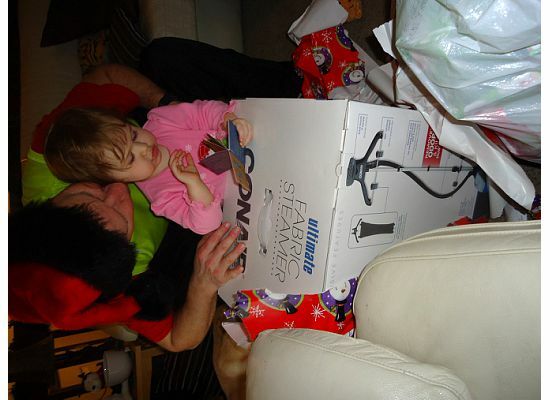 She was in wonder at all the presents and really enjoyed playing with her cousins on Christmas Day. 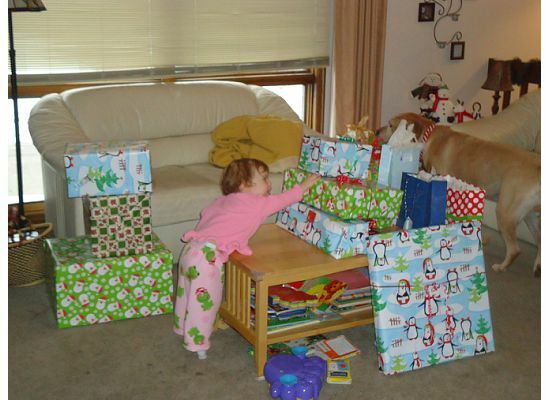 Here she is, standing on her tip-toes, trying to get at one of the gifts in her pile. Notice Samson is trying to attack from the other side and get at one of CJ’s gifts. They’re double-teaming us!! It really struck me just how much she’s grown since last Christmas, when she wasn’t even crawling or anything (she was 3 months old). She pretty much just laid around while the rest of us enjoyed the day. 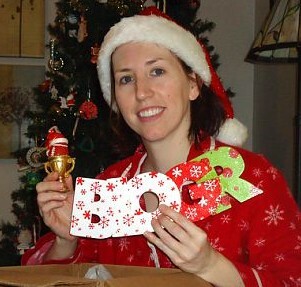 This year she was a full participant and it was so much more fun! I got some really great gifts this year. CJ did awesome and every single gift was great. 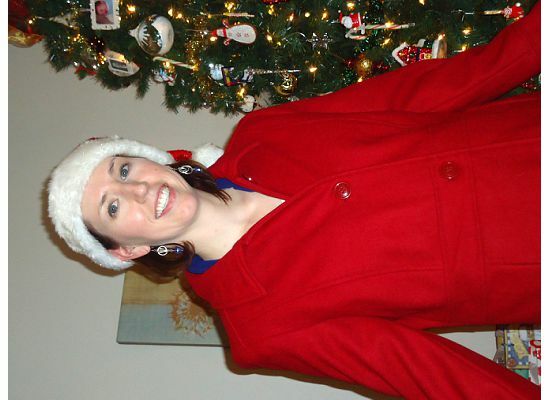 He got me a nice wool dress coat. I am seriously lacking in dress coats so this was perfect and totally unexpected. The only ones I have are the Couch Coat, which isn’t heavy enough for really cold days, and one that I’ve had since high school. The one he got me is red, so it matches Isabella’s little dress coat, and is sassy too! 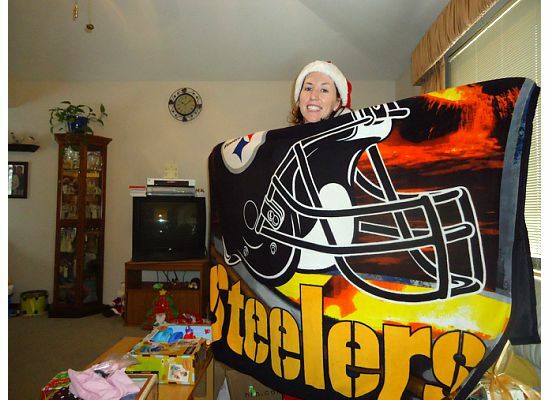 He also got me a bright green Champion workout shirt and a Pittsburgh Steelers warm, fuzzy blanket – which is AWESOME! The most creative gift he got me was my ornament (we exchange ornaments every year that are supposed to show something about that year or it could be representative of something we really like). He found some Christmas-y letters and spelled out “BLOGR” (yes, we know that’s not how you properly spell “blogger”, but it makes it more fun…that and he somehow misplaced the other letters). It’s really cute and it symbolizes this blog, which has been so much fun for me to get started and build up over the last couple months. and a 2011 Marvel calendar. 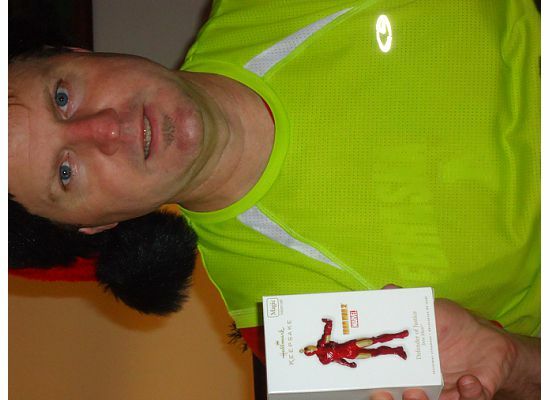 His ornament was Ironman, because he’s my super hero (all together now…awwwww). Yesterday, reality hit as I got up and looked around at all the “stuff” to be put away. There were bags and stockings lying around, toys to be pulled out of boxes, food to be eaten, decorations to be tucked away and general all-around cleaning to be done. I am somewhat of an organizational freak and hate clutter. 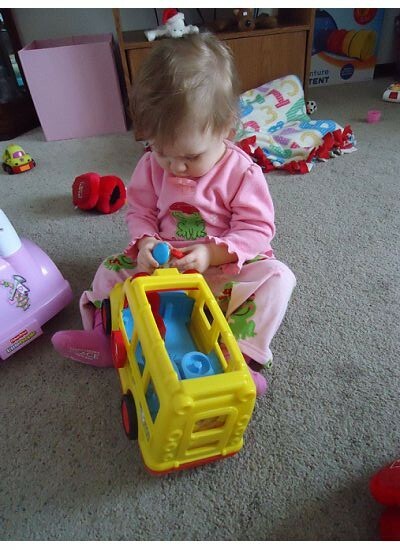 As I scanned the living room, I saw toys everywhere and I started to develop a tick. Our house is not that big so we don’t have the luxury of setting up a separate playroom for Isabella. Therefore, every room in our house becomes her play room. But, I also don’t want her stuff to take over. So, I had to develop a system. I started with going through all her toys and deciding which ones were keepers and which needed to go. The ones that we kept got put in 2 piles – those that she still plays with and those that she’s outgrown but we want to hang on to for the next baby (no, I’m not pregnant, just planning ahead). The ones that were to go were also sorted – toss in the trash or give to charity. Once that was done, I cleared out a canvas tote box from her room and began cleaning up the living room. All the small toys and stuffed animals got put in this box, which was then tucked against the wall, out-of-the-way. I paired down her books (over time, all her books had moved from her bedroom to the living room) and only kept out new ones or those she’s really in to right now. Those went on the bottom shelf of the coffee table. Big stuffed animals were tucked away into a bench we have. It looked so much better when I was done…that is until Munchkin got up and started playing. Then things were back out and scattered all over, as shown in this picture. That’s ok though. I’m fine with mess while she’s up and about, actively playing with everything. Heck, it makes it more fun some days. It’s when she’s in bed and there’s still stuff everywhere that I start to itch. I have a plan in mind for how to get even more organized and still give Isabella her own play/toy corner, once the Christmas tree comes down. I’ll tackle that project next year (seems so weird to say that doesn’t it?). Today it was back to work. Oh how painful it was when the alarm went off at 5:30 a.m. I had fitful sleep anyway (more Fantasy Football dreams…I know, I have issues) so I was really tempted to hit snooze and skip my workout, but I didn’t. I was a good girl and got my booty downstairs to our “gym” (aka, my collection of workout DVDs, weights and an elliptical machine). I am only working 2 days this week as CJ is having dental surgery on Wednesday, but 2 days will be enough. In fact, it will be more than enough. I’m working from the mall these 2 days and am the only one here from our group. Bob is at the West office, the Brit is back home in England, the Texans are in Texas and the Indians are either smoking the hookah working from their hotel or at the west office. I like the quiet, but I also like the hub-bub when people are here. Hopefully I can get a lot done these 2 days and then relax and not think about work while I’m off. It was a long day but it’s done now and I just have one more to get through until vacation. Kind of fun to have a Monday and a “Friday” right next to each other in the week! How was your Christmas? Are you glad or sad that it’s over? 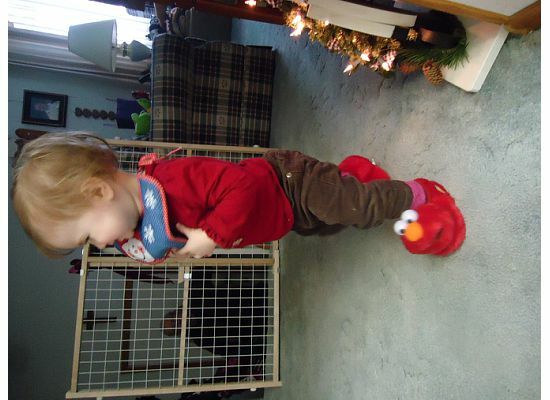 Alex loved his Elmo slippers! Wore them forever!